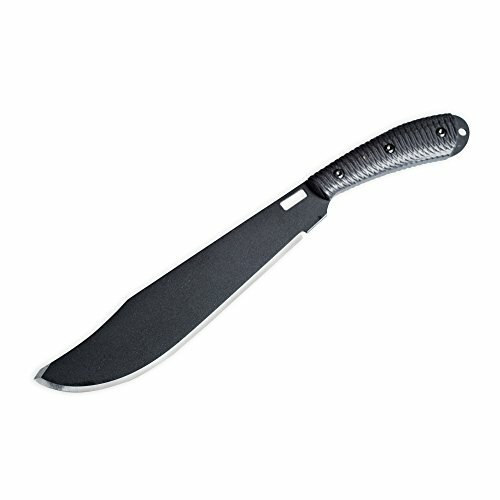 This extremely durable machete/bowie knife is environmentally friendly, made in the USA and has a custom-designed quick thumb lock and release mechanism. The Grandaddy features an 11-inch blade with a G10 handle for a secure, all-conditions grip. The blade is cut from a reclaimed carbon metal sawmill blade and differentially heat treated to bend up to 90 degrees without fracturing. The skeletonized Kydex sheath features a comfort belt clip and an adjustable webbed nylon leg strap that creates an extra secure carry. If you have any questions about this product by Southern Grind, contact us by completing and submitting the form below. If you are looking for a specif part number, please include it with your message.